The Extension Board is perfectly crafted for continuous and heavy usage. Connect more than 3 devices at a time. Made of top quality material to perform long. If you use lots of devices that run on electricity then one wall socket is not enough for you, you need an extension board. If your charger wire is short and you want to use the device at some place far then you can buy an extension board. 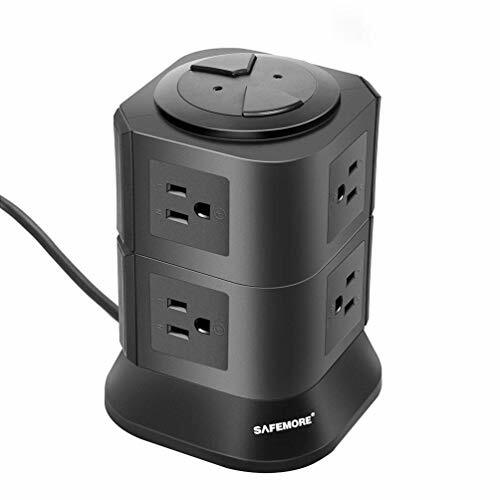 Safemore power strip is an ideal solution for charging multiple devices simultaneously, ideal for home / office / school use. Unique tower & desktop design to make it more convenient for life, you can plug everything into this power strip including those bulky power supply adapters. Two independent switches to make it easy to turn off the appliances when not in use, ENERGY SAVING! LED indicator makes you aware the sockets are in use or not, especially at night, offers more safety and convenience. Safemore power strip is made of advanced flame-resisting materials with built-in overload protection, short circuit protection, overcurrent protection,etc. overload protector can automatically cut off the power when overloaded and protects your devices immediately. Please ensure that the total rated power of charging appliance is under 1250W. Stop using immediately when the power cord are overheating. Avoid using the wet hands to touch the sockets or plugs. Do not disassemble the unit if not professional. 12 months worry-free product guarantee and a lifetime customer service for every purchase[VERTICAL CHARGING STATION]: 8 AC Outlet power strip, provides power for 8 devices simultaneously, ideal for home / office / school use. Get power for your personal computer, printer, modem, mopping robot, lamps, fans, toasters, TV, etc. [PURE COPPER POWER CORD]: 3.28FT 100% copper extension cord. You can put anywhere you want, in the dining room, bedroom, kitchen, recreation room, etc. Get Power from any angle you want.